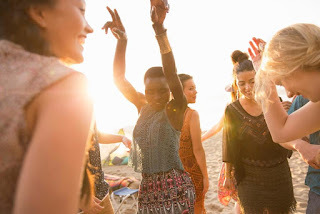 What Is Ecstatic Dance – and Can It Improve Your Health? THE STARS. THAT'S WHAT Karen Bond remembers most from her first ecstatic dance experience on a farm in Wales in the 1980s. She also remembers the drumming, chanting and, of course, the dancing that lasted until the sun replaced the stars. While she didn't know anything about the people around her (save her boyfriend, with whom she had traveled), she felt deeply connected to them. "The feeling of unity, universal love – it's really actually hard to describe what it's like, and yet we know what a person is talking about in a sense when they describe this experience," says Bond, who was working in the dance department of an Australian university at the time. Fast forward 35 or so years, and that kind of spontaneous, joyful movement to music that wordlessly connects people is formalized in classes, programs and meetups across the U.S. Called many things including conscious dance, ecstatic dance, improvisational dance, trance dance and spontaneous dance, the practice is easiest to describe in terms of what it's not, says Sonya Pritzker, a Chinese medicine practitioner and assistant professor of anthropology at the University of Alabama who runs a monthly dance "tribe" in Tuscaloosa. It's not ballet, hip-hop or Zumba; it's not a rave or even a sober dance party; and though it may look like it's dancing like no one's watching, it's not that either because people are watching – and that's a lot of the beauty of it. "It's people watching with love and support," she says. "For some people it's spiritual, for others it's emotional, for others it's physical." For her, it's a chance to be herself – not an academic, not a mother, not a 42-year-old woman living in the South. "I've had a moment where I laughed so hard [dancing with a friend] that we fell over laughing," Pritzker says. "You wouldn't do that in the grocery store." Some practices have more structure than others. While Pritzker, for example, may put on a goofy '80s song for her tribe to dance to, a branded program like 5Rhythms has a framework of phases participants move through; each phase with a different intention. "5Rhythms is movement meditation and we bring our awareness to the way that energy moves through our bodies," says Jeffrey Boynton, a lighting designer and certified 5Rhythms instructor in Charlottesville, Virginia. Dancing, like singing, has likely existed since the beginning of mankind. "[They] were probably the earliest art expressions," says Bond, now an associate professor of dance at Temple University's Boyer College of Music and Dance in Philadelphia. Cultures all over the world have used dance for rituals, rites of passage, celebration, connection and more, Pritzker says. But now, organized, spontaneous dance practices – as oxymoronic as that might sound – are gaining visibility, in some ways riding the popularity wave of other awareness practices like yoga, meditation and tai chi. The Ecstatic Dance Community Foundation even lists 22 dance locations in California alone, 34 in other areas of the U.S. and 25 in other countries. "From what I've seen, it's much easier than it was 15 years ago to find a place to move anywhere," Boynton says. He came to the practice when living in New York City. "I was hooked immediately," Boynton says. "It was like a whole language that had nothing to do with words. I could go in the space, I could move and I left feeling like weight [was] lifted." Research has linked dance of all types to wide-ranging physical health benefits including improved cognition, increased mobility, improvements in heart health, reduction in falls among older adults and more. In some cases, the practice may help heal injuries. That was the case for Boynton, who's had two serious back injuries in the past decade. "Getting into a place of moving has been integral to me healing it," he says. While he also worked with a physical therapist and treated his back in other ways, too, the 5Rhythms practice encouraged him to really listen to his body and find ways to move through the pain. But the most profound benefits of such practices seem to be mental, emotional, social and spiritual. In an informal survey of her students and other dancers on Facebook, Pritzker found benefits could often be categorized in one of two ways – freedom from something like anxiety, negative thoughts and stress, or freedom to do something like move without constraints, be present, connect with others or experience joy – and pain. "Different people will be faced with different things when they begin to move the body – if it's something that's not been part of their lives," Boynton says. For example, if you find a new way to move your body, or see someone moving in a way you've never considered, your mind might open, too, to new ways of viewing problems, yourself or the world around you. The 5Rhythms program, for one, aims to help people move through whatever sensations and emotions come up using their bodies in a way similar to how a meditation or yoga practice may encourage people to acknowledge and release them through breath. "It's not therapy," Boynton says, "but it can be incredibly therapeutic."